What are the advantages of PDR over the conventional Panel and Paint? Panel & Paint: Depending on the size of the panel to be repaired, it will cost you anything from $350 to $1000. Panel & Paint: Repairs need to be done at the shop, so the vehicle can be away from the owner for up to 3 days or more. Dent Magician: Repairs are done onsite and finalised in about 30 minutes because we come to you at home or work and perform the removal while you wait. Panel & Paint: Repair technique causes the vehicle’s original paint to be ground away subsequently requiring a paint touch-up which offers a risk of mismatch paint which could decrease the value of the vehicle. 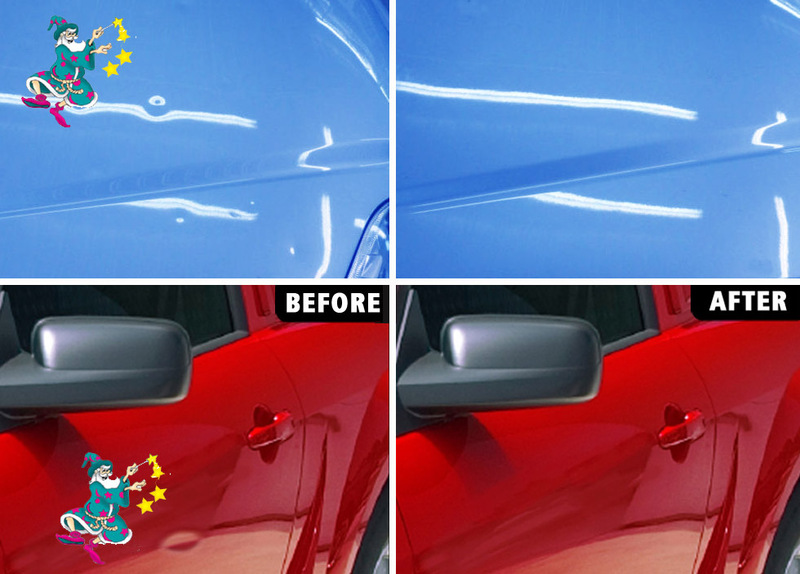 Dent Magician: Repair technique doesn’t damage the vehicle’s original paint job helping retain its re-sale value. How much does it cost for a PDR repair? Dent Magician operates with two prices: Wholesale Rates and Retail Rates. Different prices apply for different customer categories, which is understandable: a commercial establishment such as a car dealership or a panel and paint shop work with hundreds of cars on a daily basis, so they are more likely to require our services more frequently and therefore we can afford to offer our services at wholesale rates. Private customers are charged retail rates, see details below. Dent Magician retail rate commences at $120.00 including GST per panel. Our retail rate is certainly not the cheapest in the marketplace and it would be very easy for us, like some, to charge less for a poorer repair, but this is not how we conduct our business. We appreciate that all our clients want the best repair possible for their vehicle. Because we spend more time and effort to get the best repair possible using PDR the economics is that we must charge slightly more. If you have multiple panel damage we offer a 15% discount off the total repair account. Because we are a mobile service, our Dent Magician technicians will come to your place of business. Our very competitive wholesale rates are available to all our High Volume clients so you can still retain your profit margins on the vehicle upon sale. We also offer multiple panel discounts. To get the full disclosure of our wholesale rate and to calculate how profitable dealing with Dent Magician can be for your business, give us a call now on 0800 NO DENT (66 33 68) and speak to your local technician now. Every repair is backed by our guarantee that if you’re not truly satisfied with the results then we most certainly won’t be satisfied either. Some customers have concerns that if the repair is not truly removed they will still have to pay, no they won’t! If the technician does not achieve a 100% of what he has quoted to the client then there is no charge. Do you lease a vehicle? Please complete the form and submit for a no obligation quote or general enquiry. If a repair enquiry is submitted the form will be forwarded to the technician nearest you who will contact you within 24 hours. Paintless Dent Removal is the removal of small cosmetic dents created by such things as shopping trundlers etc etc. We do not do large crash job. We do not repair plastic bumpers.